This dress originally had a large-sized rosette in the middle of the waist, which made me think twice about purchasing it. So glad I saw past its initial flaws. A few snips with the scissors and the problem is solved. I found this in a vintage shop in New Orleans (of course) and it seems somewhat old – any thoughts on what era it might have come from? that dress. It looks great on you! These pictures are spectacular. Everything about them is amazing. Just stunning. I'm running out of wonderful words to describe how fabulous they are. Give me a minute… I know I have a thesaurus somewhere! Now that it's so cold here, the big sweater coats are going to be perfect. I need to find mine! girl you look amazing! the dress, the shoes…. it's all perfect! I love how you combined the feminine elements of the lace and the dainty necklace with the straps on your belt and boots. Much better than any old rosette! You look wonderful, as always! The dress is so stunning! The belt makes it even more so, and gives it an interesting edge. Sometimes I forget how beautiful you are. Then like a splash of cold water it hits me when I click over to your page. Christ, E. YOU ARE LOVELY. The dress looks total '50's to me, on the later side of the decade, fresh formed, optimistic and lady like, great day-dress. You make it look modern with your fuzzy booties, the severely chic bob, and the chunky cardigan. I guess I haven't been to your page in a while. Always good to come back. Oh my goodness, that dress is absolutely darling. I love how you styled it too. So beautiful! stunning! you never fail to impress us! this is such a romantic look, but still edgy with your "furby" boots. love it. Looks very 50s! I love how you've "wintered" it up. I'd have to agree with fifties. It is lovely and the combination of the thick belt and stunning footwear with the snuggly cardigan just gives the outfit a timeless quality. You look beautiful, and the setting just amplifies that. Dear Lord. These photos are just GORGEOUS. Honestly. Hands down the loveliest thing I've seen all day, and I spent the day antiquing, so that's saying something! I love the furbies in this context….they look so rough and rustic juxtaposed with that dainty dainty dress. From the silhouette and the neckline, I'd guess it was mid to late 50s. But back to how rad these photos are…just….wow. Beautiful dress! Like LoveCharlesVintage, I'd guess 1950s from the shape of the skirt. Does it have a washing care label? And a metal or plastic zip? That dress is lovely! Sometimes I too have to look past weird features on vintage clothes, it's all part of the fun! Gorgeous dress. It will be wonderful in the summer time. i think the dress is totally late 50s or early 60s…it's so betty draper, therefore, i love it (of course). The sweater looks like it was meant to be. Super cozy and perfect with the boots. Love your belt and booties, and that lace dress is such an incredible find! This photos are absolutely breath-taking! Not to mention your outfit. You look stunning. such gorgeous photos!! they have such a romantic quality to them. So pretty! Love the dress and those boots! These photos are great! This is straight out of an Anthropologie add isn't it? No really thought it could be. Great outfit, lighting, and photos. I really love these photos.. you are gorgeous hun. I flat out, adore this outfit. And photos in the attic? umm AMAZING. You are so clever to alter that dress a bit, it looks so beautiful!! I love the lighting. That dress is gorgeous too! You're a great thrifter! Gorgeous dress! I feel like you need to be sprawled on a decrepit chaise lounge in that attic with a pouty look and more eye makeup, and you'd have some Vogue-worthy editorial pics! I think the dress looks rather early 60s to me, especially the bust line. Especially if it came from a Southern Lady, which is why I think it's 60's, not 50's, since fashion moved a little slower down here. Great find. I live in NOLA, and I'd love to know where you bought it! 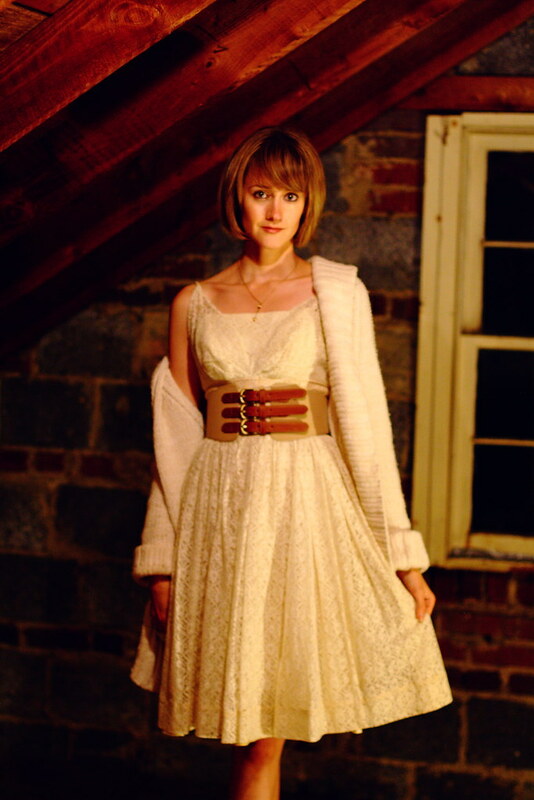 I WISH I had an attic to take pics in with gorgeous vintage clothes … LOVE THIS!! I just wanted to say that I LOVE these photos and also that I appreciate the Shel Silverstein reference. I'm thinking you should send some copies to the publisher to see if they'll do a reprint with these photos on the front. Your photos give such a cool vibe to your outfit. That dress is a great find! omg this dress is ravishing! These photos are beautiful, as is your delicate dress. I really like it paired with your wonderful booties. I can't get enough of those booties! Why oh why do my indoor pictures NEVER turn out this cozy and beautiful? I adore this! you are so lovely! i love the vintage dress with that belt. I love everything about this look E! one of my favorite looks from you ever– the furry boots, the vintagey dress & the perfect backdrop to your outfit! The lace dress is so elegant. It's always important to see not what is, but what could be, while thrifting. You look so PRETTY! You have a great eye for items when thrifting, too! That's such a beautiful dress. White dresses do look so pretty. And those boots look really warm! i'm no expert at all. is there any label? you look very sweet here. i like your saddle outfit in the last post. love the belttt ! and the fur boots ! beautiful! Amazing with those shoes! That dress and belt are fabulous! Love the mix of leather and lace and fur. So cool! Pretty dress, I love how versatile your belt is! Such a cute dress and love the scenery for your photos…so beautiful! Check out my fashion blog if you have a chance! and these look like stills from a MOVIE! Such a fan of this look! Awesome belt!